Qualification : Master in Science (Maths) & Master of Computer Application. 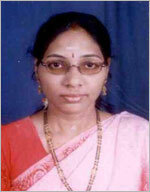 Ms. Gayathri has an experience of around 10 years in teaching Business Mathematics. She is very sincere in her efforts and dedicated herself in upgrading the knowledge of the students. She is a double Post-graduate. She has done her Masters in Science (Mathematics) and also in Computer Applications. In addition Ms. Gayathri has an M.Phill. Degree. She has also attended the Soft Skills Training Program conducted by the British Council. Her experience includes working as Lecturer for Mathematics in various Maitrayi Degree College, EThames College.